As one of New Zealand's largest primary sectors the people of New Zealand are looking to the forest industry to help improve New Zealand's economic performance and living standards. Some good progress is under way with Woodco's New Zealand Forest and Wood Products Industry Strategic Action Plan, plus the Science and Innovation Plans for both forest growing and wood processing. Some good work is also being co-ordinated by the Bay Plenty and Waikato Regional Councils to prioritise heavy transport road works needs in the upper North Island. One additional contribution our industry could make is in Health and Safety performance. 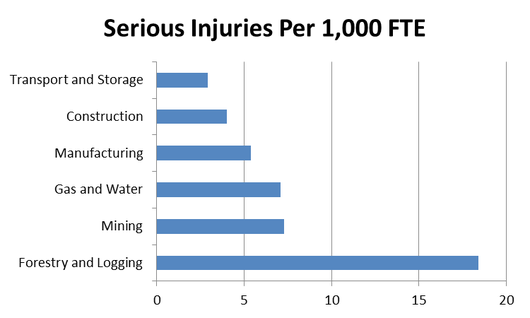 Despite some impressive gains in the last decade our industry is a large contributor to the estimated annual $1 billion cost of industrial accidents and is the worst performer in terms of serious injuries per million hours worked. These statistics are even more depressing in the context of where New Zealand rates in the frequency of fatal industrial accidents relative to some other OECD nations. Following some tragic accidents in the adventure tourism sector it is great to see that the New Zealand Government is recognising that action needs to be taken on drug induced impairment in the workplace. Despite an effective random drug testing regime in at least the major forest industry participants and responsible contractors, it will take a society-wide attitude shift to use of drugs at or before work to make a real difference. That shift can only be Government led. A project to get under way this year at the BLF is the Supply Chain Safety Initiative. In the forest industry I think we have quite an advantage over some other sectors in that most forest owners/managers are already very well connected with contractors and other suppliers and there is a shared vision to reduce workplace harm. What is also evident is that many forestry and harvesting contractors have a strong safety culture and excellent record. But some do not and it is this group that is dragging our industry down. If the same safety leadership commitment were shown by all forest leaders, be they forest company staff or contractors, as we get from the top performers, we could certainly achieve a step change. That would save lives and all the individual, work crew and family trauma that goes with serious harm. There is also evidence and now common acceptance that high performance in worker safety and other positive business metrics go hand in hand. Thus apart from the direct costs associated with accidents, improved safety can help lift the profitability in the forest sector, and make a material contribution to New Zealand's economic performance.